This is from a recent property photography session, featuring interior and exterior shots. It was in fact in Wiltshire on that particular occasion, but I cover Somerset and much of Dorset too. The room was bright and had a relaxed atmosphere, and I wanted to capture that, as well as its spaciousness. The decor was pale throughout, so it was important to strike a balance: to create an image bright enough to catch the airy feel of the room, but not so bright that it became overwhelming. I used a super-wide-angled lens to get in as much of the space as possible, then used digital editing software to correct the angles, getting all of the verticals perfectly upright. I think it has worked out rather well. 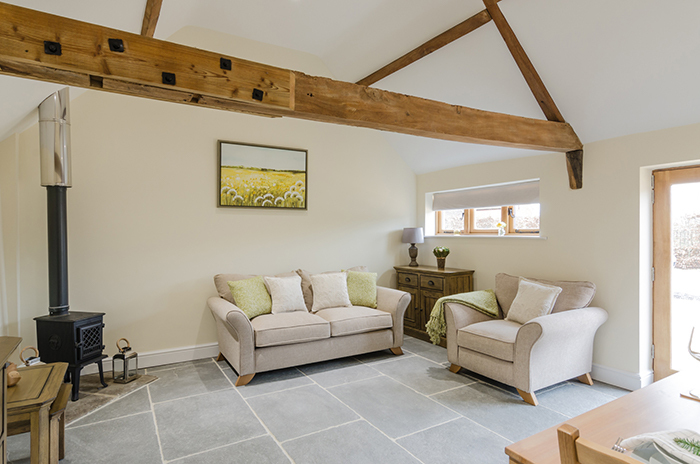 The photograph shows the full breadth of the room, as well as the slate floor and beamed roof space. Even a bit of the dining table in the foreground has crept in. The wood-burning stove and patio doors, which are at opposite corners of the space, are both caught by the 12mm lens. The pale decor is nicely balanced: it has a hint of shadow and is not too stark. Please check out my Architectural and Property Photography page for more like this. The images on this site are set at just 700 pixels long side. However, I use 24 megapixel cameras, so I can provide very large photographic files, suitable for almost all purposes.